When setting up an estate plan, the first thing you need to determine is how will your assets be managed and distributed to your beneficiaries if you have no will or only a will on the date you die and whether you are satisfied with what will happen in that case. Many people are surprised to find out that a will alone may still require your executor to file a probate case before assets can be accessed and distributed. Alternatively, some rather simple estate planning before you die can make sure that your desires are enforced and effectuated in the most efficient manner depending upon the types of assets you own. The best way to determine what options are available to you is to set up some time to review all of your assets with an attorney specializing in trusts, estate planning, wills, and probate. San Luis Obispo attorneys at Toews Law Group, Inc. are experts in these topics in California. Downloading a form or instructions about drafting a will from the Internet might seem inexpensive, but in the long run, doing it yourself and trusting that everything turns out according to your wishes might be very costly. A will that is not done correctly and in strict compliance with the laws of the State of California can leave your estate vulnerable to unnecessary objections, expenses, taxes, claims, probate hearings, and even loss substantial discord among your heirs. In California, some personal property may be transferred without the need for probate whether you have a will or not. This process is available when certain assets have a combined value of less than $150,000. If you have a will, the assets will be transferred to the person(s) you name and if you do not have a will, to your heir(s) at law. 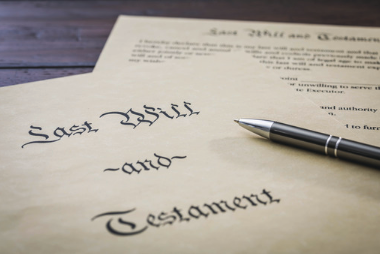 However, if you have real estate or other types of investments, it will be more likely than not that your estate will require a probate action if you do not have a will or a will alone. California Probate Code § 6110 states that a will must be in writing, signed by the testator and signed by at least two persons who were both present together at the time the testator either signed or acknowledge that he/she signed the document and who understood that the document they sign is the testator’s will. Does it clearly state who I am and that this is my last will? Does it supersede any previously signed wills? Does it clearly list my spouse? Former Spouse? Children – whether living or deceased? Does it dispose of all of my property? Does it provide for alternate dispositions if my first choice has died before me? Does it name an executor? Alternate executors? Does it require that my executor receive a bond? Waive a bond? Does it nominate guardians for my minor children? Does it contain an attestation clause? Although this list appears rather simple, proper articulation of the language may not be simple and if not clear and concise, may lead to unnecessary confusion and disappointment. Discussing your will with a qualified attorney can help make sure your wishes are upheld. Just as importantly, an experienced attorney can also advise you on other and more effective ways of protecting your estate for your heirs such as establishing a trust. Choose an attorney experienced in wills, trusts, estate planning, and probate. San Luis Obispo attorneys at Toews Law Group, Inc., are highly experienced in all matters of wills and estate planning. The attorneys at Toews Law Group, Inc. are focused on providing trusted and superior legal services in estate and tax planning, and trust and probate settlements, and assisting businesses and non-profit organizations. Contact them today.